Non-Powered Operation with Chemical-less Technology. ENERLES, the Highly Valued New System in the World. 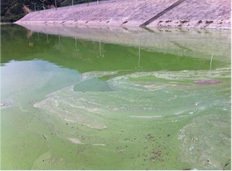 ENERLES successfully reduced odor and awful taste from dam water, which was caused by algae’s eutrophication. 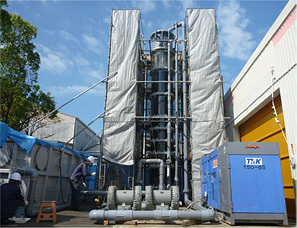 The system is operating smoothly at a water treatment facility of Changxing County located in Zhejiang province, China. Dams are constructed widely around the world for agricultural, industrial, domestic and commercial purposes and also for water control as flood countermeasure. However, along with the community development, dam water pollution has become one of the serious problems. In Changxing County, China, the dam also encountered the problems such as odor and water pollution. NAGAOKA technology has helped to solve these problems without using chemical nor electricity. Water head difference between dam and water treatment facility is used for treatment process, so no electric power is required for operation. 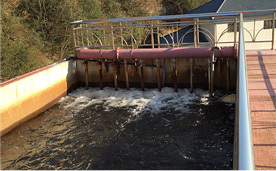 High filtration speed as 170m/day, and compact filtration type using no chemicals. Simple structure and effective treatment by a combination of Nagaoka screen and special oxidation nozzle , and easy operation. ENERLES is simple structure design integrating sand filter, NAGAOKA core technology of screen, and special oxidation nozzle. Therefore, operation and maintenance are also easy. AERSYS which removes VOC (Volatile organic compound) and FCD (Free carbon dioxide) from groundwater and surface water to the water quality standards required by Japanese Ministry of Health, Labour and Welfare. The water source for drinking water, such as groundwater and river water may contain harmful substances to human body, such as VOC and FCD. Japanese Ministry of Health, Labour and Welfare already set up the water quality standards for these substances in drinking water. In conventional method, since huge equipment, vast energy, and large amount of chemicals are required, high-cost on construction, running and maintenance has been the problem. 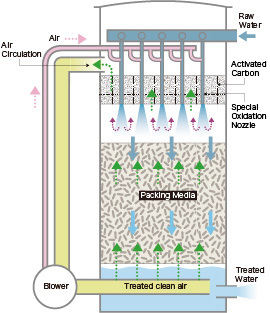 AERSYS, co-developed with Tokyo Metropolitan Waterworks Bureau, is the innovative system to solve these problems, which can remove over 99% of harmful substances by using only air, packing materials, and activated carbon to provide safe and secure palatable water at low cost. ●Remove VOC or FCD to the target level in a single process. ●No additional space for incidental equipment is required by reuse of clean air purified through activated carbon for aeration. ●Simple maintenance by non-chemical treatment and automatic operation provides stable performance at low cost. ●No harmful effect on the surrounding environment by air circulation system which cleans the contaminated air and recycle the air inside of the treatment system without emission.